High sensitivity sizing and zeta potential measurement of particles in fluid suspensions; Zeta potential measurement of flat surfaces. This is the first instrument in the industry that measures zeta potential distribution of concentrated solutions using ELS. It uses the patented forward scattering through transparent electrode technology (FST) to measure zeta potential of particles in various suspension concentrations up to 40% or higher depending on particle size. Because of the Brownian broadening of scattering spectrum at high scattering angles, the common practice in measuring concentrated samples using back scattering cannot be used in zeta potential measurement. The FST is the only known technology that can measure zeta potential of particles in concentrated suspensions. This is the first in the industry that measures zeta potential of flat surfaces or samples using ELS. Surface charge or zeta potential of bare, treated, or coated flat surfaces or samples such as glass, metal, metal oxide, ceramics, etc. in liquid can be measured using DelsaNano. A unique approach in DelsaNano makes these measurements possible. The DelsaNano series can measure particles as small as 6 Angstrom and as large as 7 micron with molecular weight as small as 267 Dalton in a concentration range from 1 ppm to 40%. It uses precision optics to avoid light intensity and coherence loss due to fiber optics collection. The utilization of both log-scale and linear-scale correlators makes measurement of broadest size range possible. 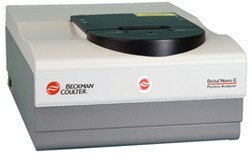 There are no threads in Beckman Coulter Delsa™Nano Series Reviews at this time.